Rather than being the easy way out, letting go of a dream can require immense bravery. It takes courage to say, “enough is enough,” to step off the treadmill and often, away from the support we might have there. It takes courage to know that your decision will bring sadness and loss, to absorb that as part of you, and to continue to face the world every day. It takes courage to say good-bye to our dreams or expectations, without knowing what will replace them. 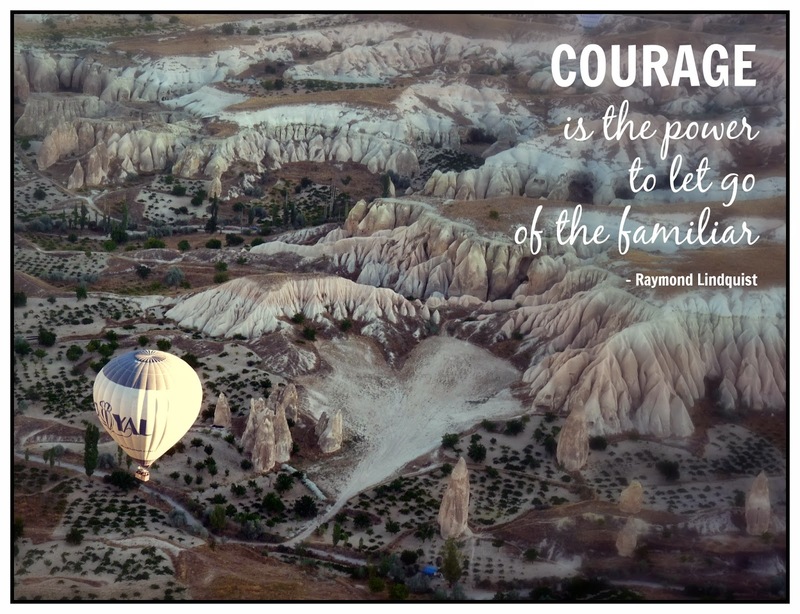 It takes courage to face head on the emotions of grief, sadness and loss, of isolation and otherness, and to feel them fully, working through them, to come out the other side. It takes courage to let go of the expectations and hopes of others – family and friends - to bear the burden of their sadness and disappointment as well as our own. It takes courage to step out from the crowd and live a life that is different, and visible (even when we feel invisible). It takes courage to tell your story, knowing that speaking (or writing) it will make it real. It takes courage to own the life we live, to step above the judgements of family, friends, society (including our own IF community) that might see us forever as “less than. It takes courage to absorb so much loss and judgement, from others and ourselves, and then to let it go, to acknowledge that we are not responsible for others’ hopes and dreams for us, to accept that without guilt. It takes courage to fully live and embrace a life different to the one you had planned. It takes courage to be a heretic, to see and celebrate what we have, not what we have not. That courage becomes part of us. When we use it, it grows. It has given me courage when facing other losses, other health issues, and our own old age. It has given me courage where and when I didn’t know I had any. Beautifully said. Thank you for this powerful reminder. Funny how writing it out makes the courage stand out more. You just made me realize that I do have courage (even though I'm feeling really weak right now). Thank you for writing this! I needed this reminder too. Infertility and coming out of it with no child has caused me to forget A LOT. I forgot that I'm strong, caring, and yes, courageous. Thanks to you (and sometimes my other fellow bloggers) for helping me to REMEMBER. Beautifully written, many thanks for writing it. I needed exactly this today. Oh wow, this made me cry. It brought back the memories of deciding to stop treatments and pursue adoption... I found it so hard to let go and give in to the grief but man I'm sure glad I did. WOW!!!! This is so empowering and soothing at the same time, Mali. Thank you for writing this! Thank you for this post. It was validating and reaffirming for me. Sometimes I wonder if I cut off possibilities. But, I know did what was best for me.